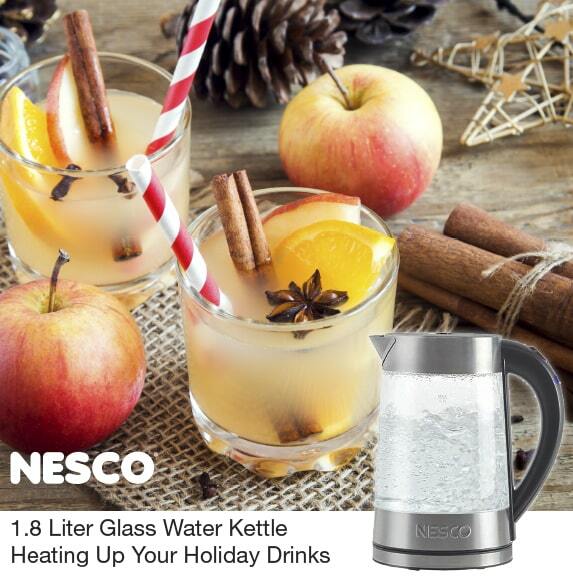 The NESCO 1.8 Liter Glass Water Kettle is ideal for making delicious hot holiday drinks. It boils water faster than a microwave and uses half the energy of a stovetop. 1500 watts of power quickly heats water for all your drinks like Tom & Jerry’s, hot toddies, spiced teas and hot instant cocoas. For great Tom & Jerry’s the Internet offers dozens of delicious recipes. The base of hot water, whipped eggs and liquor makes the perfect foundation for a rich creamy drink. From there the added flavor combinations are almost endless. Grated nutmeg and cinnamon are a favorite. Try a few and let us know what you think. Also let us know what are some of your favorite uses for your NESCO Glass Water Kettle.